Neither Republicans nor Democrats are positioned to make major gains in the House next year. Republicans are slightly likelier to net a tiny gain than Democrats are. Ergo, the Republican majority in the House appears secure. To review: Republicans currently hold a 233-200 seat edge in the House, with two vacancies soon to be filled in special elections (a super-safe Republican seat in Alabama, and a super-safe Democratic seat in Massachusetts). Additionally, Rep. Rodney Alexander (R, LA-5) is slated to resign next week (leaving another safe Republican seat behind). All told, Democrats need to net 17 seats to win a majority, which is quite a heavy lift. 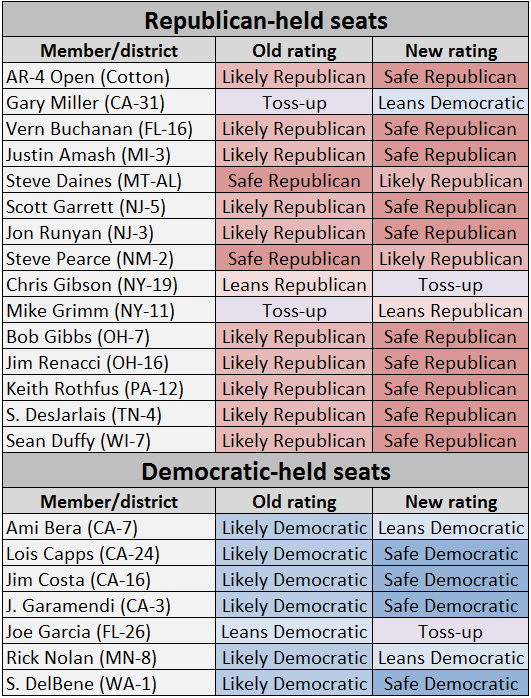 All that gloomy news for Democrats aside, there is at least one positive for them in this new set of ratings: For the first time this cycle, we’ve made an incumbent member of the House an underdog, and he’s a Republican: Rep. Gary Miller (CA-31). Miller won a fluky election in 2012 because California’s new jungle primary system produced a general election between two Republicans in a district where President Obama won 57% of the vote. Even though there is a crowded primary on the Democratic side, Miller is likely to be the only Republican to advance to the general election. We believe his eventual opponent will be favored. But after that, pickings get slimmer for the Democrats. First, take a look at Chart 1, which shows our House ratings changes. Notes: Members in italics hold seats that the other party’s presidential candidate won in 2012. *Signifies that the member might not make it to the general election because of retirement or a primary challenge. A red-shaded seat in the Democratic column or a blue-shaded seat in the Republican column means that the incumbent party is an underdog to hold the seat. Full ratings of all 435 seats are available on the Crystal Ball’s House race page. These modified House ratings significantly narrow the field. Prior to this update, we listed 363 seats as safe; now, we list 375 as safe, leaving just 60 seats in the Likely/Leans/Toss-up categories. With an additional 20 seats listed as likely for one side or the other, that really just leaves 40 truly competitive seats — and even that might be too many. AR-4 (Safe Republican): While this seat is opening up because of freshman Rep. Tom Cotton’s (R) challenge to Sen. Mark Pryor (D-AR), it does not appear that Democrats will actually put up much of a challenge in a district that Mitt Romney won with 62% of the vote. There is a consensus among our sources that if there is a competitive race in Arkansas next year, it will be in AR-2, held by Rep. Tim Griffin (R), which is a more Democratic seat (55% Romney). Former Lt. Gov. Bill Halter (D) could run a credible challenge there, but for now all four Arkansas seats are Safe Republican. CA-31 (Leans Democratic): The Gary Miller seat, explained above. FL-16 (Safe Republican): Democrats have long hoped ethical troubles would bring down Rep. Vern Buchanan (R), but those problems — involving his financial disclosures — are largely receding in the auto dealer’s rearview mirror, and he’s raising a ton of money to deter potential challengers. MI-3 (Safe Republican): Now that he is no longer in the mix to run for Senate, libertarian-leaning Rep. Justin Amash (R) should be fine in his reelection bid. Democrats appear more focused on other targets here, such as the seats held by Reps. Dan Benishek (R, MI-1), Tim Walberg (R, MI-7) and Kerry Bentivolio (R, MI-11). MT-At Large (Likely Republican): It appears to be only a matter of time before freshman Rep. Steve Daines (R) enters the state’s open Senate race, where he’d start out as a favorite. That would open up a House seat in a state where Democrats have had a lot of statewide success. John Lewis (D), former state director for the retiring Sen. Max Baucus, is already running. Corey Stapleton (R), a former state senator who lost a primary for governor last cycle, switched from the Senate contest to run here, yet another indication that Daines is likely to vacate this seat. NM-2 (Likely Republican): Democrats are talking up recruit Roxanne Lara, a former county commissioner, in her challenge to Rep. Steve Pearce (R). The district isn’t all that favorable on paper — Obama only got 45% here in 2012 — but it also is a majority-Hispanic district where Democrats hope they can use immigration against the incumbent (Pearce opposes a path to citizenship for undocumented immigrants). Lara lost a bid to become the state Democratic Party chair earlier this year. This is a long shot for Democrats, but it’s also worth watching. NY-11 (Leans Republican), NY-19 (Toss-up): We’re flip-flopping the ratings in two competitive New York races. Like Buchanan in Florida, Rep. Mike Grimm (R, NY-11) has been haunted by ethical questions, but his problems have not yet caught up to him (and maybe they won’t). Beyond that, Grimm is a well-respected campaigner whose challenger, New York City Councilman Domenic Recchia (D), is from Brooklyn in a Staten Island-based seat (although he’s also a decent Democratic recruit and better than Grimm’s 2012 opponent). Meanwhile, Rep. Chris Gibson (R, NY-19) is facing Sean Eldridge (D), a wealthy investor and activist married to Facebook co-founder Chris Hughes. The expectation among some observers on both sides is that Grimm is in better shape than Gibson; hence, we’re flipping the ratings. Both remain top Democratic targets, but neither will be an easy lift. OH-7, OH-16 (both Safe Republican): Speaker John Boehner (R-OH) didn’t engineer a gerrymander of his home state after 2010 to be embarrassed on his home turf. Reps. Bob Gibbs (R, OH-7) and Jim Renacci (R, OH-16) continue to be the beneficiaries. Renacci had a nasty member-versus-member race against ex-Rep. Betty Sutton (D) in 2012, but he looks OK now. PA-12 (Safe Republican): While there is some action stirring on the Democratic side against Rep. Keith Rothfus (R), the decision by ex-Rep. Mark Critz (D) to forgo a rematch here takes this race off the board, in our view. TN-4 (Safe Republican): Whether Rep. Scott DesJarlais (R) survives his primary or not — he very well may not given his significant personal baggage — a Democrat is not going to capture this 65% Romney district with Obama in the White House. WI-7 (Safe Republican): Democrats don’t seem to have anything going against Rep. Sean Duffy (R), a 2010 winner who is laying down some deep roots in the district formerly held by longtime Rep. David Obey (D). CA-7 (Leans Democratic): Likely Democratic was probably a too-generous rating for Rep. Ami Bera (D), who won a tough race against ex-Rep. Dan Lungren (R) last November. A number of Republicans are running here against Bera; the best of the lot is probably ex-Rep. Doug Ose (R), a moderate who kept true to a three-term limit (retiring after the 2004 election) and then ran in a 2008 primary to replace retiring Rep. John Doolittle (R). Ose lost to current Rep. Tom McClintock (R) in that race. As one shrewd observer recently pointed out, the Ose candidacy will be an interesting test of California’s aforementioned “top-two” jungle primary system, which is supposed to reward moderation by eliminating partisan primaries. If another, more right-wing Republican advances to face Bera, it wouldn’t be a good sign for the effectiveness of the jungle primary — and it would be a relief to the incumbent, Bera. Also running as a Republican in this district is Elizabeth Emken, who was soundly defeated by Sen. Dianne Feinstein (D) last cycle. CA-3, CA-16, CA-24 (all Safe Democratic): Nothing much to see in these three Democratic districts: Republicans have better targets in California. If a national GOP wave develops, maybe they come back on the board. One additional note about California: CA-26, held by Rep. Julia Brownley (D), will be listed as more competitive if she truly faces Republican Tony Strickland, a former state legislator who ran a good race against her in an open-seat race last cycle. However, we continue to hear credible rumors that longtime Rep. Buck McKeon (R) could retire this cycle. While Strickland sounds committed to running in neighboring (and more Democratic) CA-26, we continue to wonder whether he might switch races in the event of McKeon retirement. So Brownley stays Likely Democratic, though the seat is a legitimate GOP target. FL-26 (Toss-up): South Florida doesn’t exactly have a sterling reputation for clean politics, and both the former holder of this seat — scandal-tarred ex-Rep. David Rivera (R) — and the current one — Rep. Joe Garcia (D) — aren’t improving that reputation. Garcia is facing questions over his former chief of staff’s “ties to a phony Tea Party candidate’s secretly funded mail campaign,” the Miami Herald recently reported. A number of potential quality challengers are going to try to flip this seat back to the GOP, although Garcia, despite his problems, is a strong campaigner and fundraiser. Republicans will throw the kitchen sink at Garcia in 2014, lest he gain a greater hold on the district, which was one of the few in the country to give Obama a bigger share of the vote in 2012 than in 2008. MN-8 (Leans Democratic): Republicans are excited about their challenger to Rep. Rick Nolan (D): Stewart Mills (R), a wealthy member of the family that owns the Fleet Farm retail chain, which has about 30 stores in the Upper Midwest. Nolan still has an edge in this ancestrally Democratic district, which was held for decades by former Rep. Jim Oberstar (D) before his surprising loss in 2010. Mills will probably need a little push here from national forces, and it’s unclear how good of a candidate he will be, but MN-8 belongs among the more competitive races. WA-1 (Safe Democratic): The GOP didn’t show much interest in contesting this swingy but clearly Democratic-leaning district when it was created during Washington’s nonpartisan redistricting process last cycle, and with wealthy Rep. Suzan DelBene (D) running for a second term, it’s hard to see why national Republicans would suddenly become interested now. Of the 40 most competitive seats, Republicans currently hold 16, and Democrats currently hold 24. 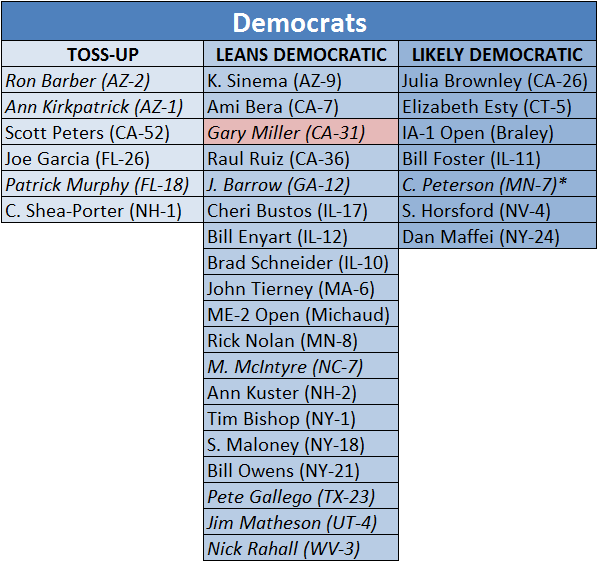 Democrats have six Toss-ups, while Republicans have two Toss-ups and one race where they are an underdog (Gary Miller in CA-31). The truly competitive playing field is bigger for the Republicans right now than it is for the Democrats and, truth be told, these ratings might be too generous to the Democrats. 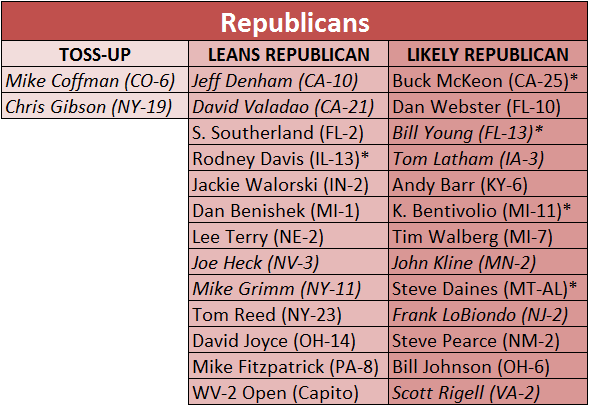 One could make a credible case that many of the races in the Leans Democratic column above — CA-7, CA-36, IL-10, NC-7, TX-23, UT-4, WV-3 — actually belong in the Toss-up category. For various reasons, we feel the Democrats have small edges in these districts at the moment, but these are all very legitimate Republican targets. Meanwhile, the Leans Republican category is a bit more durable. The closest races there are IL-13, MI-1, NY-11 and NY-23. In other words, if we were more generously calling races Toss-ups, there would be more Democratic seats to add to that column than Republican ones. Earlier this cycle, Crystal Ball Senior Columnist Alan Abramowitz, a professor at Emory University, unveiled his House elections model, which gives a pretty accurate range of outcomes for the race for the U.S. House. Check out the full details of the model for yourself, but essentially the only factor that remains unknown is the state of the congressional generic ballot poll about a year from now, when the 2014 midterm will really come into focus. Democrats need to have a big lead in the generic ballot — 10 points or more — to have a real shot at retaking the House, Abramowitz’s model shows. 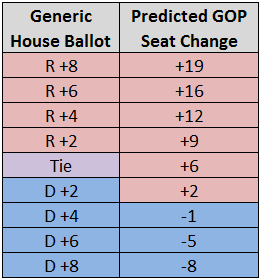 If we assume that the generic ballot is somewhere between a tie and D +2, the model shows a very modest Republican gain. That squares with the seat-by-seat analysis above. The national forces that could push the House race one way or the other have yet to materialize. Democrats hope that Republicans self-destruct in the upcoming fiscal fights and wreck their brand so completely that they kick away the majority. Republicans bet on a disastrous rollout of Obamacare, a bad economy and an unpopular president bolstering their caucus. Either partisan dream scenario is possible. In the meantime, the race for the House sits largely in stalemate, waiting for a big push that might never come.